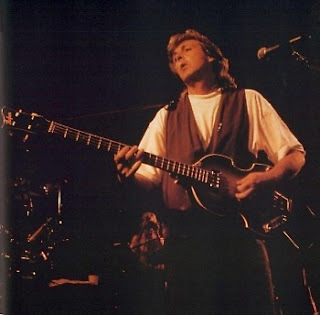 The 1989 Paul McCartney World Tour was the first time Paul had played the US since Wings Over America in 1976. 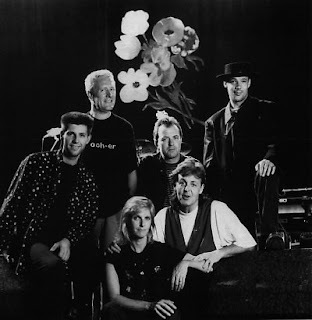 He took the road with a new band; Paul Wix Wickens (on keyboards & piano) Robbie McIntosh (guitar, once of the Pretenders) Hamish Stewart (guitar, formerly of the Average White Band) Chris Whitten on drums and of course Linda McCartney (keyboards) whom Paul would always introduce as Gertrude Higgins. The 1989/1990 Tour had 104 Tour dates, 45 in the United States, 6 in the New York area. A free 98 page Tour booklet was given out at each show with profiles of the band, Paul’s career & Tour stats. 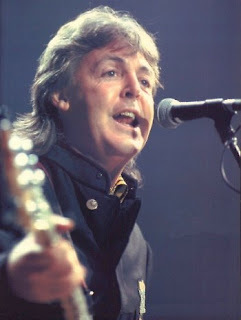 Paul sported long hair and wasn't afraid to play Beatles songs, like in his Wings days. The Tour began in September in Norway, after rolling through Sweden, Spain, Europe & the Netherlands; it hit Los Angeles on November 23, for five nights. 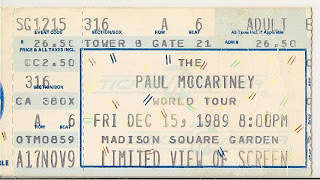 Passing through Chicago & Canada, it arrived in New York at Madison Square Garden for four sold out shows on December 11th, 12th 14th & 15th. The tour resumed after the holidays with 18 shows in England including 12 nights at Wembley arena. The Tour came back to the to the US for large Stadium shows throughout the summer. 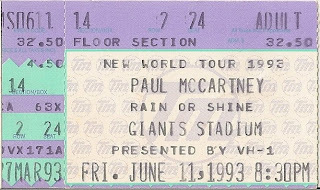 I attended another Giants Stadium show in July 1990. The Tour ended in Chicago on July 29, 1990. Paul had just released the Flowers in the Dirt album, that June. It was his best work since 1982s Tug of War, the album went gold but only peaked at #21 on the charts. The single My Brave Face got a lot of rock radio airplay & reached #25 in the US Top 40. George Martin did some work on the album, as did Elvis Costello & David Gilmour. Other notable songs on the album were Figure of Eight (which usually opened shows on the Tour); Put It There & Rough Ride. 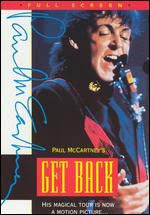 The tour was documented by a live double album Tripping the Live Fantastic, and the 1991 film Get Back. During the Tour Paul had added a John Lennon tribute doing a medley of Strawberry Fields/ Help / Give Peace A Chance. He also did Maybe I’m Amazed & Matchbox at some shows. 18. Back in the U.S.S.R. 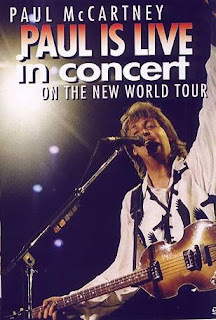 In 1993 the Paul McCartney New World Tour hit the road promoting the album Off the Ground. The Tour started in February in Milan, Italy and hit the US by April, opening in Las Vegas. The tour had 74 dates worldwide, only 21 US shows, mostly at large stadium venues, hitting Giants Stadium on June 11, 1993. The band was the same as the last tour except a new drummer was on board, Blair Cunningham. 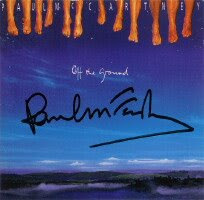 The Off the Ground album was released in February 1993 with the same band who also played on Flowers. The album hit #18 and went gold i n the US but didn’t have a hit single. Hope Of Deliverance bombed as a hit in America. Other notable tracks were Off the Ground & Looking For Changes (which was an angry animal rights song), Paul seemed to sing more about social issues, this is not a great album in my eyes. Paul put out another live album from this Tour Paul Is Live. It didn’t sell well due to the fact it was his third Live (including Unplugged) released in a three year period. 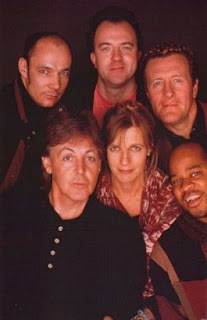 This would be the last Tour for Linda McCartney before her passing, and the last for that McCartney line up. 6. "Let Me Roll It"
7. "Peace in the Neighborhood"
9. "Can't Buy Me Love"
13. "I Lost My Little Girl"
17. "Biker Like an Icon"
18. "Here, There and Everywhere"
25. "Live and Let Die"
27. "Back in the U.S.S.R."
29. "Sgt. Pepper's Lonely Hearts Club Band"
30. "Band on the Run"
31. "I Saw Her Standing There"